Bedford to Nashville; it’s over four thousand miles, but Danni Nicholls somehow manages to connect the two in a way that’s totally convincing and authentic, so let me just say from the start that “The Melted Morning” is an assured, warm and satisfying piece of work. There are lyrical references on the album that relate to both sides of the pond. Sitting happily side by side on the album are “Unwanted”, with its scene-setting American speed limits and vocal that evokes Rosanne Cash, and “Wish I Were Alone” with its London Road reference. And it helps that Danni has a rich and versatile voice that’s equally at home with country or soul stylings. Danni’s a songwriter who enjoys the process of collaboration with other writers, and there are quite a few of those involved in this project, including Ben Glover, Robby Hecht, Jess Morgan and Amelia White. It’s something that works well, but I’ll come back to that later. The other interesting aspect of this album is that Danni chose to put it together with a predominantly female team for some very good socio-political reasons but also because ‘they were the absolute right people to help bring these songs to life’. Whether it’s that collaborative dynamic or just that the structure of the songs leads to certain arrangements and stylings, the songs develop and unfold at a leisurely pace (only two songs clock in at under four minutes); nothing feels rushed, the songs are allowed to breathe and it’s not about individual egos. It’s all about the songs, and what beautiful songs they are. Danni and her collaborators spin intriguing tales of unconventional relationships, unrealised ambition and sometimes even just some straightforward, unvarnished love songs. “Hear Your Voice” and “Power to Leave” feel like a matched pair with slightly different takes on the business of success as a musician, while the latter has a soul feel and some gorgeous Latin horns pushing the arrangement along. And that thing I was coming back to. The album’s packed with collaborations but the songs that really push my buttons are Danni’s solo writes. “Lemonade” is another twist on ‘when life gives you lemons…’, while “Ancient Embers” and “Hopeless Romantic” are both intensely personal. I understand the logic of closing the album with “Hopeless Romantic”; it’s a perfect summation of a beautiful piece of work. Buy the vinyl, stick it on your deck and just let it wash over you; you’ll feel so much better. “The Melted Morning” is released on Friday April 12th on Danni Nicholls Music (DNM002). Do you ever have that feeling that you should really like an album because everyone else likes it, but you can’t seem to grasp why it’s so popular? That’s the way I feel about this album. Before anyone gets offended, I have to say there isn’t a bad song on the album, the musicians are some of Nashville’s finest (including Chris Donohue, Bryan Owings, Will Kimbrough and Stephen Leiweke) and Danni Nicholls is rated very highly by many country performers and insiders, but my buttons remain defiantly unpressed. I’m not even saying I don’t like “Mockingbird Lane”; I think the problem for me is that everything sounds just a little bit too refined, a little bit too well-polished with no rough edges or sharp corners to offer a contrast to the smooth balance of the album. Across all eleven tracks, absolutely nothing jars but, equally, nothing grabs my attention and forces me to listen. Seven of the eleven songs on the album are co-writes with a variety of other artists and maybe what’s happening is that Danni’s originality is being pressed (knowingly or not) into a Nashville pop format by her collaborators. Of the four solo writes, the opener “Long Road Home” with the theme of going back home after originally running away and “Leaving Tennessee”, with some tasteful finger-picked guitars and mandola, feel more personal than the rest of the album while “Sad Swan” uses a metaphor of a cygnet on the river before its time to represent someone who isn’t ready for a relationship. These songs feel like there’s genuine Danni DNA in there, and that’s not something you can say for the rest of the album. There are a couple of songs that pretty much sum up my reaction to the album and one of them is “Back to Memphis”. There’s some lovely piano on the track, but there’s a line ‘Want to hear a song where the words don’t rhyme’ which you wish had been applied occasionally; a non-rhyme or an unexpected rhyme or an unusual metaphor occasionally would have made such a difference. Just the title of “Beautifully Broken” is illustrative; broken, but with a few missing pieces or ragged edges might pique the interest a little more than the pristine country pop served up here. There’s a lot to like about this album, but not really enough to love; true, it’s only Danni Nicholls’ second album and I’m looking forward to hearing what the future holds. Her voice is already superb and when the material truly matches the voice, she will be a formidable force. 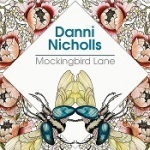 “Mockingbird Lane” is out on October 23rd on Danni Nicholls Music (DNM001).